Click on the image. Wait. 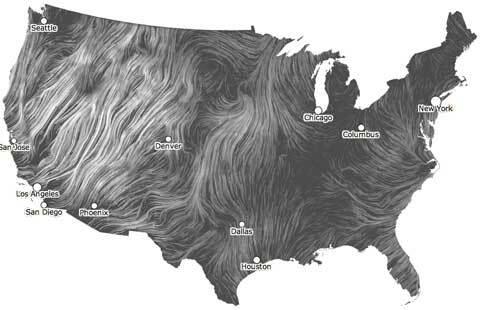 Watch and be mesmerised by this visualisation by Hint.fm of current wind flow over the USA. It’s a tremendous way to get a feel for the shape of the weather. Something similarly hypnotic and revealing of weather patterns is the animation of global total precipitable water (that is, atmospheric moisture content) from the Cooperative Institute for Meteorological Satellite Studies at the University of Wisonsin-Madison. I haven’t embedded it because it’s a big animation, but it’s well worth a few bits of bandwidth. The Carbon Map is another tour de force of data visualisation — changing the shapes and sizes of countries on a global map to show how they measure on a number of indices: area, population, wealth, historic emissions, current emissions, carbon reserves and so on. 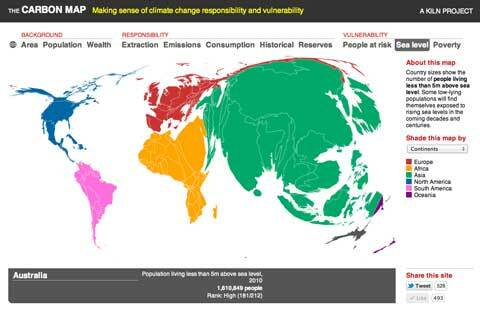 The image I’ve grabbed shows the exposure of countries to sea level rise. More about the map and its creation at the Guardian.